Your wedding day is supposed to be the happiest day of your life. When you make those vows to each other, you dream of living happily ever after till death do us part. Unfortunately with nearly 50% marriages ending in divorce, the fairytale very often doesn’t have a happy ending. When your marriage is on the rocks you try everything you can to stop it slipping away. If you have got to the stage where nothing is working and you think you have gone past the point of no return then you need to admit it’s over. This step is probably the most difficult and painful but once you have done it you can look towards the future. If it is your decision and you have to tell your partner, it will be the hardest thing you have ever had to do. The feelings of guilt will consume you but remember that it is the best thing for both of you and eventually you will feel resolved. 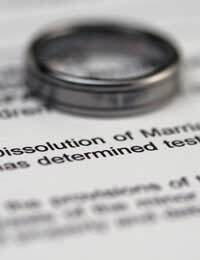 If your partner tells you they want a divorce you may feel in shock and very betrayed. However hard you try to cling onto to the marriage, it takes two people to make it work and if your partner has already checked out, you need to let it go. Splitting the assets can be a frustrating and emotional experience. All those things that you bought to make a home together now need to be divided up. Where property and large assets are concerned you will need to get a lawyer involved but try to make it as amicable as possible. You will no doubt feel angry and bitter but by being awkward and demanding more than your fair share, you will just make the process more difficult for everyone. In the same way, when you divide out the small things, taking their favourite CD might seem like fair revenge but will only prolong the agony. When children are involved in a divorce it can make everything a lot more complicated. You probably stayed in the marriage longer than you would have done, for the sake of the children. Children are very resilient and although divorce is not easy for them to cope with, ultimately it is better than living with warring parents. Any anger you feel towards your partner needs to be out aside when it comes to dealing with the children. It is not fair to stop them seeing their other parent and you need to be able to interact civilly to decide on what is best for the children. Once you have split the assets and moved out of the family home, your new life begins. You didn’t plan for it or expect to be on your won again so it can be a daunting situation. However, it is better to be alone than unhappy. Surround yourself with a strong support network of friends and family who can help through this difficult time. Keep yourself busy and try not to dwell on things too much. At the same time though, you need give yourself time to grieve for your marriage and not expect too much from yourself too soon. Work through your emotions, accept the situation and look towards the future. We all hope that we won’t have to deal with a divorce but unfortunately nearly half of us do. It is a difficult, upsetting and emotional time but you will get through it can come out the other side smiling.